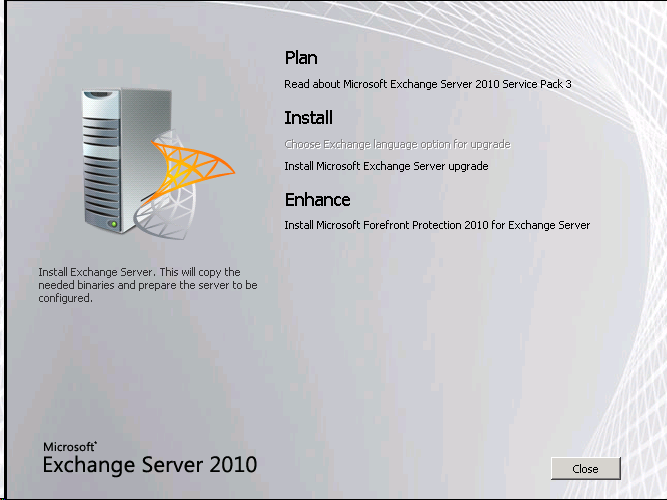 This morning the Exchange team launched the long awaited Service Pack 3 release for Exchange 2010. 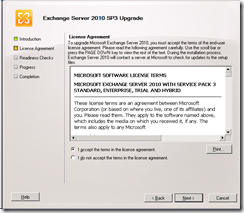 Service Packs are normally fairly well trailed and anticipated for the new functionally they bring with them, however I doubt any other Service Pack has been as awaited as SP3 has been for Exchange 2010. Back in October last year Microsoft announced that they had reached RTM for Exchange 2013 (along with the rest of the 2013 product suites) which was great news and for the first time MS had lock stepped the launch cycles of all their major productivity server platforms (Exchange, Lync, SharePoint and Office 365). The only major snag with this plan was that Exchange 2010 wasn’t forwards compatible with 2013. 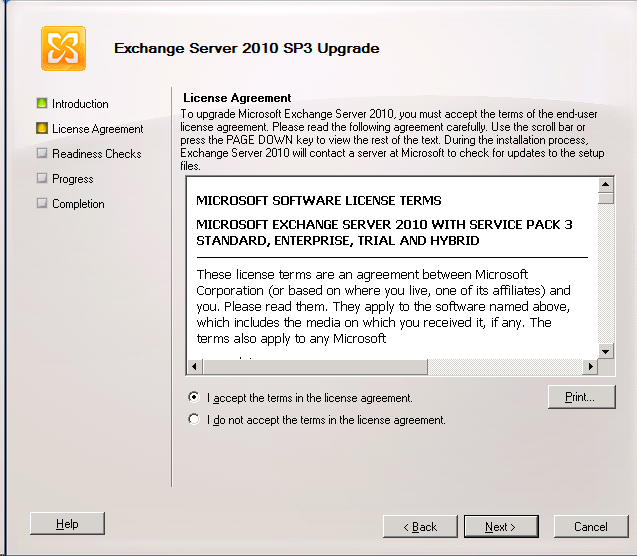 In order to install and co-exist Exchange 2013 with Exchange 2010 you had to have SP3 installed for 2010 but… you guessed it… SP3 wasn’t available. Until now. I downloaded and set away the install of SP3 this morning to capture an overview of the steps required. This guide is just meant to be a “record in pictures” of what you will come across when installing SP3, it is not intended to be a comprehensive guide to all scenarios and situations. You can find the official documentation for upgrading here. Issues fixed here. and release notes here. As with previous Exchange SP’s and installations it will upgrade your schema as one of the first things it does. Depending on your environment you can either let the Exchange installer take care of this for you, or you can manually update the schema yourself. If you want setup to take care of this for you, make sure you are running setup as a member of the Enterprise Administrators group which has rights to modify the schema. 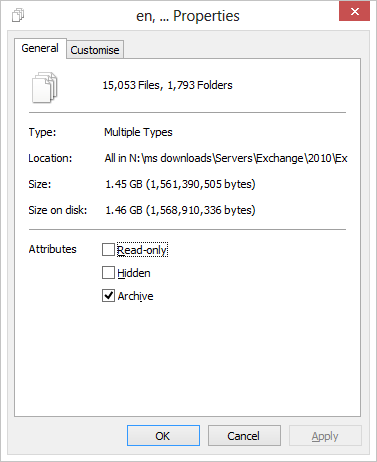 If your Exchange server is a virtual machine you might want to consider taking a snapshot of the server but this is absolutely NOT a replacement for a full backup of your exchange environment! You need to be very careful when using snapshots with something like exchange as it won’t protect you against all the changes being made in your environment. You will also need to stop incoming mail flow so that if you have to perform a restore then you haven’t lost any mail data. The only warning for my environment was to install KB2550886 which fixes an issue with Windows clustering. As I don’t run any DAG’s (which use clustering) I can safely move past the warning. I have read several ways to mitigate it but, not from anyone that has done it. Can you elaborate on this detail. Looks like it is a game changer anyway. Thanks for pointing me at that KB. I’ve added a note to the process with a link to it and a screenshot of my policy settings. This is a great site. Thanks for responding. There is a very good exchange of information and ideas here. Thanks again! I guess you did have RemoteSigned there even during the process, right? This one does not matter. Yes, I didn’t know about that issue when I did my upgrade but the screenshot you see is how mine was configured at the time. All domains and forest level = 2003! What is step-by-step upgrade for my Exchange?? Can we install SP3 on SP1. OR SP2 is compulsary. 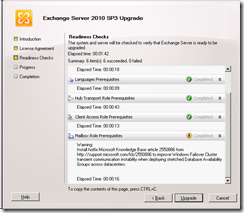 Hi AKS, no SP3 for Exchange 2010 is a full install of Exchange so you don’t need to be running a specific version before hand. It also means if you are doing a new install in future you can start straight away with the service pack. Incidentally this is new model Microsoft are using for Exchange 2013 where all quarterly CU updates are actually full Exchange installation binaries. Regarding “Exectuion Policy”… Do not change that LocalMachine policy to undefined. Your install will fail during the Stopping Services portion of the upgrade because it will not be able to run PS scripts! The good news is that if you do it (with the PS applet, like I did) you can just set it back to RemoteSigned and restart your upgrade. sir we have 2 mailbox server roles and 2 hub cas servers we would like to upgrade our exchange servers from sp1 to sp3 please give us the guide lines to upgrade . So if we have an environment that doesn’t have an existing 2010 Exchange server in it, we can use this SP3 download to perform the entire Exchange server installation? 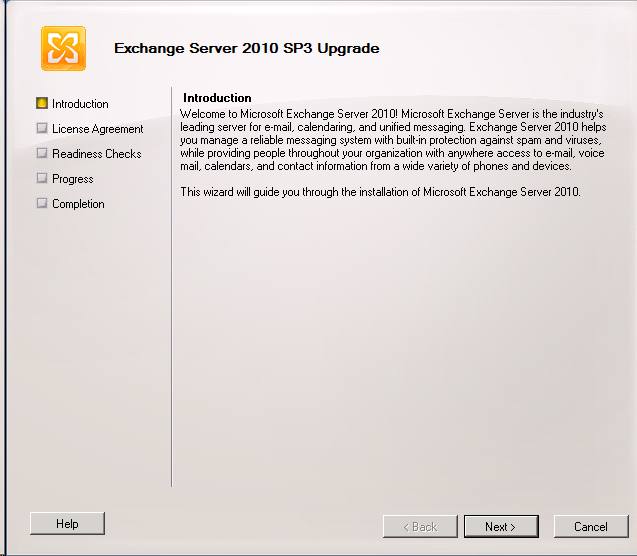 I am planning to install Exchange 2010 SP3 next week. 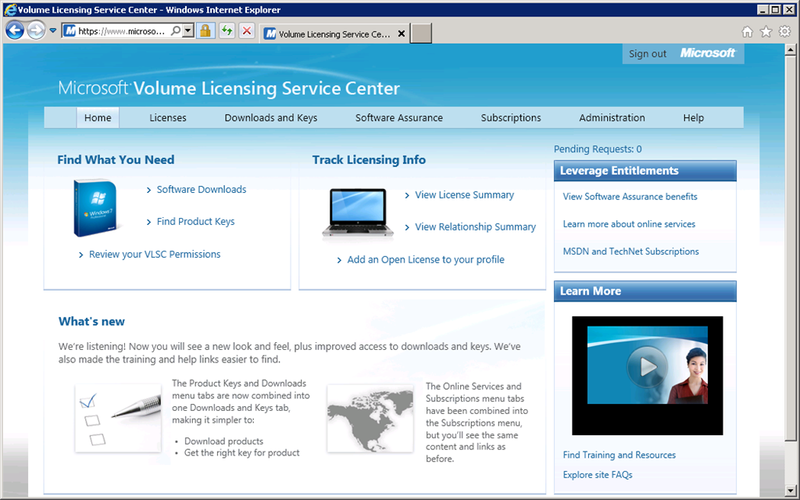 The OS of the 3 servers is Windows Server 2008 R2 SP1. 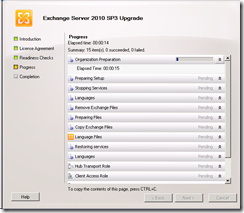 All servers are running Exchange 2010 SP1 Update Rollup 6. 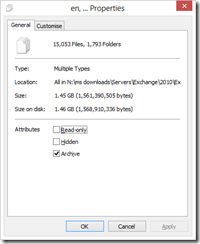 1- Do I have to change the execution policy on our Exchange servers before installing SP3? If I have to change a policy, what should I change? And how would you recommend I should do this? You should be okay. The issue seems to occur when you have changed the scripting policy via GPO which you don’t seem to have. That’s correct, we haven’t set the Powershell execution policy via Group Policy. We only configured the execution policy of “LocalMachine” to “Unrestricted” on the CAS/HT server using the “Set-ExecutionPolicy” command on the server. 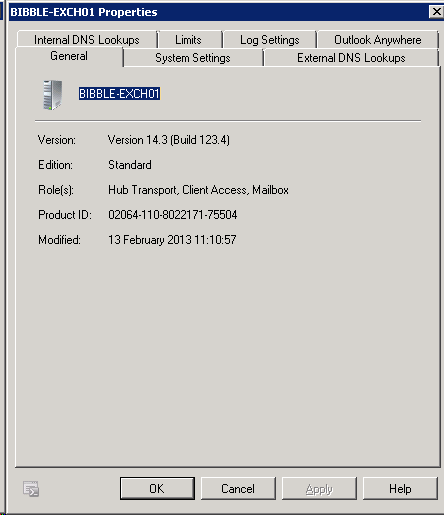 The mailbox servers’ execution policies have not been changed and are set to those values by default. I must admit, I got event more confused when I read the “http://support.microsoft.com/kb/2668686” and “http://support.microsoft.com/kb/2810617” articles. But looks like I shouldn’t worry as our current Powershell execution policies shouldn’t affect the upgrade. The upgrade from SP1 to SP3 was carried out successfully. It took ~1.5 hrs per server. I also installed UR 5 for SP3 (KB2917508) and this took ~1 hr per server. To summarise, our Powershell execution policies (listed above) did not affect the upgrade. I am getting ready to install SP3 this week. Would you install MS security patches before installing Exchange SP3? The servers haven’t had MS security patches installed in about a year. Great article. We have out Exchange environment broken out into 3 servers- ET, HT, and a mailbox server. Should the application of SP 3 be completely run Edge, reboot, then the Hub, roboot, and finally the mailbox, reboot. In otherwords, once the ET is updated, they’re backwards compatible until the next server is updated? 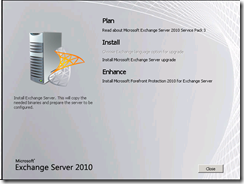 I am planning to upgrade Exchange 2010 RTM to SP3 as it is required for the migration to Exchange 2013 , 2010 RTM is running in Server 2008 Sp2 and upgrade is stuck because of the prerequisites codes mention below. 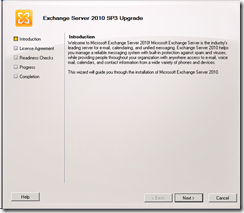 Can i prepare exchange 2010 SP3 as coexist and migrate the mailbox from 2010 RTM to SP3 and decommission the 2010 RTM.